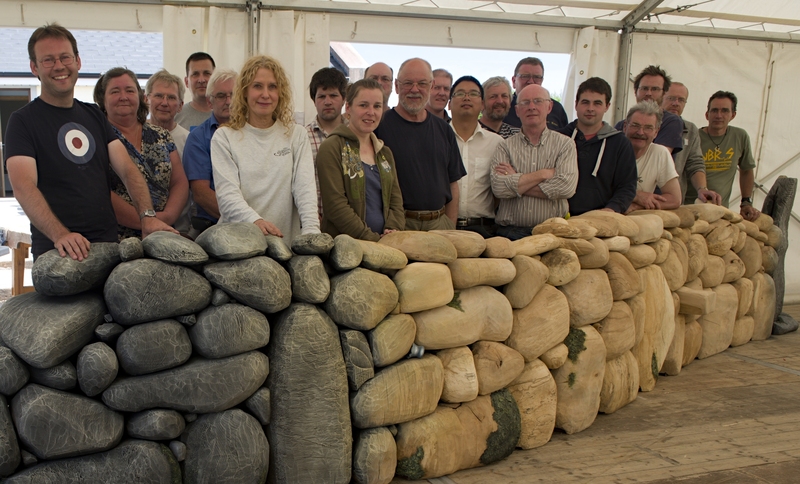 In November 2012 I received an email from Terry Martin asking if I’d be interested in joining in a collaborative event in Ireland next May/June to create a wall of wood inspired by the dry stone walls that dominate much of the Irish countryside. It was to be an international event with approximately 10 Irish artists and 10 internationals from the United States, Canada, Britain, France, China, Australia and New Zealand and the finished wall was to be exhibited as part of the Carlow Arts Festival. I thought perhaps Terry had finally lost his mind, but an opportunity to visit Ireland, work with other woodworkers and possibly catch up with my good friend and basketmaker Anne Harrington-Rees seemed too good to pass up so I agreed to take part. After hundreds of emails back and forth discussing how we might go about making this thing actually happen, we all turned up at Glenn Lucas’s studio with no real concrete ideas as to how to start, what it might look like or how it was all going to hold together but still be able to be transported to the VISUAL gallery in Carlow! Despite the shaky start we all just got stuck in and in a miraculous spell of warm sunny weather we had an amazing, intense week of making new friends, renewing old ones, and pulling together to make an incredible wall that I think surprised us all. It was exhibited at the VISUAL arts centre for Carlow Arts Festival in June – Sept 2013. Made by 22 wood artists, carvers, furniture makers and turners at Glenn Lucas Woodturning Study Centre, Co Carlow and filmed by the International Wood Culture Society. This entry was tagged collaboration, Ireland, Terry Martin. Bookmark the permalink.